The twenty-week ultrasound is the big one; organs are measured, digits are counted, gender is determined (if you’re interested in that sort of information). Our appointment at New York-Presbyterian (the neonatal unit is located in the historic Lying-In Hospital dating back to 1799) loomed large on our calendar for weeks. That it marked the edge of our long-planned “Babymoon” — one week in Puerto Plata, Dominican Republic booked long before that island shook in sympathy with Haiti — only added to its heft. My brother encouraged us to video tape the affair. My boss suggested the same. I’m a fan of the YouTubes, and TMI, but felt cautious. While Abbi is obviously pregnant (bystanders now inquire), and we’ve already seen the little bugger in his (or her) twelve week ultrasound, he (or she) hasn’t kicked or karate chopped or otherwise made him (or her) self known. I didn’t want cameras rolling if there was bad news to deliver. The waiting room was crowded with couples of all shapes and stripes: LES hipsters in ripped jeans and piercings, Upper East Siders in blue blazers and Pulitzer prints, Abbi and me somewhere in-between. I banged on my Blackberry, endeavoring in vain to knock out incoming emails Missile Command-style. We walked quietly to our examining room, all viewless windows and humming air conditioner. The technician introduced herself to Abbi. Vestigial, apparently, I introduced myself, then took my spot in the “Daddy Seat” next to my wife. The lights dimmed. Abbi lifted her shirt, and lowered her waistband. The monitor above my left shoulder flickers to life. A cone-shaped, blue-and-white picture morphs and shifts, and I see him (or her) there. The ultrasound moves through layer of skin and bone revealing puzzling, chilling, inspiring, miraculous glimpses. One minute, the baby looks like a cherub, the next, and alien, the next, a skeleton. It’s unnerving, beautiful, and unbelievable all at once. The technician zeros in on our baby’s heart, all four chambers beating in double-time. She cans the femur, then humerus. She finds the left hand, all five fingers splayed wide. We gasp. Peering into Abbi is a miracle. A thousand possibilities flash before my eyes: a runner, a ballerina, an academic. It’s impossible not to project my hopes, anxieties and dreams on this unborn child. Sitting there in the dark holding Abbi’s hand, I think of all of the roads, decisions, missteps, and mistakes that led me here. And, for the first time, I can imagine how this child will lead me there, wherever there is. 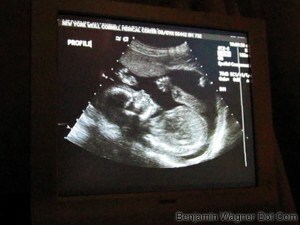 Awww…I loved seeing Baby Wagner’s first video. Congratulations to both of you! Thank you for sharing! OMG…hello my little niece/nephew…i can’t wait to meet you! !